Beautiful, bright, and cheerful decorations are a big part of the holiday season, but cats and dogs can interpret the decorations differently than we do. That is, a Christmas tree can look like a huge and inviting toy. Here are some tips to make sure the decorations are safe for everyone - including our four footed family members. 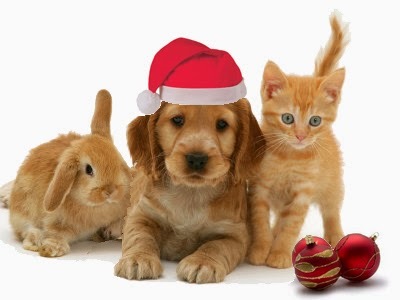 Christmas trees with their lights and glimmering decorations are irresistible to some pets. Anchor the tree so your cats and dogs can't knock it over. Some dogs try to stand up against Christmas trees to check them out, and some cats love to climb in them. If you have a real tree, clean up any fallen tree needles regularly. They are quite sharp and can cause pain and damage if they get stuck in a pet's paws or throat. When decorating your tree, go for decorations that won't shatter if they fall, and try to find things too big for your pet to accidentally swallow. Also keep tinsel and ribbons off the floor. Tinsel looks harmless, but can cause serious damage along with a huge vet bill if eaten. All the holiday lights are festive, but make sure to protect power cords so your pets can't chew on them or play on them. This is probably a bigger problem for cat owners than for dog owners, but puppies want to chew on everything. If you use candles, make sure they're out of reach so a pet can't knock them over, or get their fur singed. The holiday season also comes with a range of decorative house plants. Any form of holly is toxic to cats and dogs. Keep mistletoe, rosemary, and holly out of reach, and contact a veterinarian if you think your pet might have eaten any part of the plant. If your pet eats anything they shouldn't, petpoisonhelpline.com is a great website where you can look up various plants, foods, and other products.